The University of Illinois Press is pleased to announce the appointment of Quincy D. Newell, associate professor of religious studies at Hamilton College, and Benjamin E. Park, assistant professor of history at Sam Houston State University, as co-editors of Mormon Studies Review beginning January 2019. They succeed J. Spencer Fluhman, who served as the journal’s editor since 2013. Quincy D. Newell is an expert in the religious history of the American West. Her writing has appeared in publications including the Journal of Africana Religions, American Indian Quarterly, Religion Compass, and The Catholic Historical Review. Her essay “What Jane James Saw,” in Directions for Mormon Studies in the Twenty-First Century (2016), edited by Patrick Q. Mason, won awards from both the American Society of Church History and the Mormon History Association. Among other books, Newell is the co-editor of New Perspectives in Mormon Studies: Creating and Crossing Boundaries, published by the University of Oklahoma Press in 2013; and the author of Your Sister in the Gospel: The Life of Jane Manning James, a Nineteenth-Century Black Mormon, forthcoming from Oxford University Press. Her research has been supported by grants and fellowships from a variety of organizations, including the American Council of Learned Societies, the Louisville Institute, and the Charles Redd Center for Western Studies. Benjamin E. Park received his Ph.D. in history from the University of Cambridge, served as the inaugural postdoctoral fellow with the University of Missouri’s Kinder Institute on Constitutional Democracy, and currently teaches American religious history at Sam Houston State University. His articles have appeared in Church History, Journal of the Early Republic, Early American Studies, American Nineteenth-Century History, and Journal of Mormon History, among other venues. His first book, American Nationalisms: Imagining Union in the Age of Revolutions, 1783-1833, was published by Cambridge University Press in 2017, and his second book, The Kingdom of Nauvoo: A Story of Mormon Politics, Plural Marriage, and Power in Nineteenth Century America, will be published by W. W. Norton/Liveright in early 2020. He is currently editing A Companion to American Religious History for Wiley-Blackwell. Both scholars have experience with the Mormon Studies Review prior to their appointment as co-editors, as Dr. Newell served on the editorial advisory board and Dr. Park served as an associate editor. They have also worked together as members of the Mormon History Association’s Board of Directors. 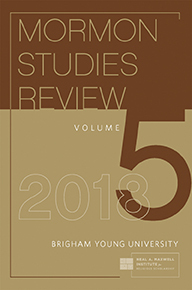 Since it was re-launched six years ago, Mormon Studies Review has been the premier review journal of a popular, evolving, and interdisciplinary subfield. Published annually, it typically includes roundtables, disciplinary essays, review essays, and a handful of book reviews that in some way cover the Mormon tradition and its wider world. Contributions traverse many different disciplines, topics, centuries, and nations, and touch on issues related to religion, politics, gender, race, and class. The authors have included seasoned leaders in their respective fields as well as junior scholars fresh out of graduate programs. The primary audience for the journal is academics and institutions who, while not specialists in Mormon studies, are interested in its scholarship as it relates to broader academic trends and topics. Prior to coming to the University of Illinois Press, the Mormon Studies Review was published by the Neal A. Maxwell Institute for Religious Scholarship, located at Brigham Young University. Previous issues can be found at https://publications.mi.byu.edu/periodicals/msr/. Mormon Studies Review is issued annually and is published by the University of Illinois Press. Full details about the journal, including advertising information and subscription rates, are available at https://www.press.uillinois.edu/journals/msr.html. Mormon Studies Review is available online to subscribers through the JSTOR Current Scholarship Program at www.jstor.org.